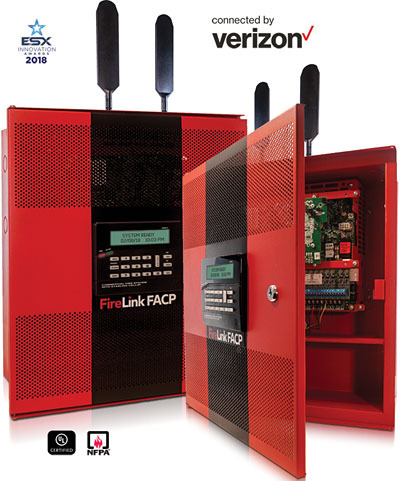 Napco Security Technologies, Inc. is pleased to announce that its award-winning FireLink™ Integrated 8 to 32Pt Fire Alarm Control Panel is now available in an LTE sole path model, #FL-32FACP-LTEVS, Connected by Verizon® LTE® Service. FireLink, and all StarLink LTE's offer the longest available cellular lifespan, over 10+ years, and the Verizon® LTE (Long Term Evolution) CAT 1 service Napco uses is the most extensively-deployed LTE Network nationwide – all for the best, most reliable coast-to-coast coverage. Plus, their unique Signal Boost™ and twin dual diversity, precision LTE antennae design, ensures greater range & reliability, maximizing signal acquisition and null-avoidance, for proven StarLink performance, even in fringe areas.